The tour will kick off in Tokyo, Japan and making stops in China, Malaysia and The Philippines. “I want to experience the spontaneity and emotion that I put into this album on stage with my fans,” she said in a statement, according to Kempire Daily. “I can’t stop writing songs so don’t be surprised if you hear a brand new song that I just wrote the night before the show in your city!” Tickets are on sale now on Mariah's official website. No word yet if she's coming to the States. 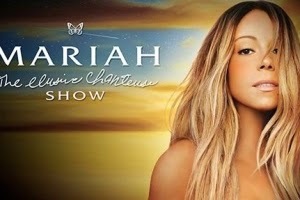 I'll admit that I probably won't be going to this tour (I unfortunately missed seeing Mariah in her prime). To me, though, I think she should do performances over in Vegas like Celine Dion or Britney Spears. She would be guaranteed to make some serious bank on the Strip! At the end of the day, no matter her sales or performances as of 2014, she is LEGEND, and will always be able to use that status to make serious bank. I wish her well with her performances. REVIEW: 2014 MTV Video Music Awards!